A superb collection of real-life medical mysteries. Patients and doctors can both have blind spots. For example, a doctor will occasionally make or refute a diagnosis based on nothing more than pride, despite a career’s worth of experience. Patients, however, sometimes troublingly deny obvious symptoms or refuse to divulge relevant information. In most cases, these patient behaviors lead to prolonged illness and pain or, in the worst cases, a patient’s death. In these nine beautifully written, captivating case studies, Halkin presents true stories of patient denial from his own experience as a physician. These complicated medical mysteries concern not only the body, but also psychological, often subconscious motives. In one such case, a young executive presents with symptoms of a rare, life-threatening ailment called Gaucher’s disease, including a yearlong low-grade fever. The patient and his wife claim that he’s never been diagnosed—until after he is prepped for an invasive procedure, when he suddenly, calmly claims says that he remembers the diagnostic tests. It turns out that after the prior diagnosis, which should have had the couple rethinking their lives, they had continued as though the doctor had told them all was well and suppressed the memory. Halkin asks: Is this behavior self-destruction or self-preservation? The author uses his formidable psychological insight not only to understand his patients’ and colleagues’ baffling behavior, but also to analyze himself (“Could I have put their right to denial before my responsibility to warn them as best I could?”). Although readers may find it chilling to consider that patients could purposely subvert their own diagnoses and treatments, they may find it illuminating to read about the complex dance of trust and fear in doctor-patient relationships. 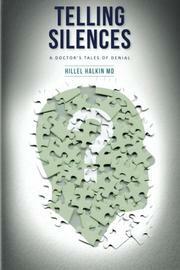 Riveting, revealing stories of patient denial.